Fort Ord National Monument, located on the former Fort Ord military base, is currently run by the Bureau of Land Management (BLM). They protect and manage 44 species of rare plants and animals that call the property home. The 14,000 acre parcel has more than 83 miles of trails that can be explored on foot, bike or on horseback. Click here for a complete map of Fort Ord&apos;s trails. The Fort Ord National Monument is great for hiking, horseback riding, mountain biking, and watching wildlife in their natural habitat. Trails are open daily from dawn to dusk and run through a range of environments, from grassy hills to coastal shrubland. Visitors are advised to stick to the trails to avoid damaging ecologically sensitive areas. Certain signed, fenced-off areas have been deemed hazardous by the BLM and must be avoided. 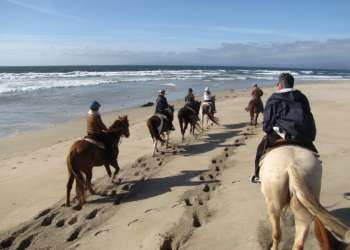 With its 83 miles of trails, Fort Ord National Monument is ideal for any hiker or horseback rider. Hikers and riders can enjoy the gorgeous views that the 6 mile Juan Bautista de Anza National Historic Trail has to offer. Equestrians should use the entrance at Inter Garrison Rd., where parking is available for horse trailers. Fort Ord is a mecca for off-road cyclists. There are several paved and unpaved trails which offer adventure for both amateurs and professionals. It is important for all bikers to stick to marked trails to avoid damaging the sensitive habitat. Not ready to take the plunge into off-road cycling? Fort Ord still has several paved roads in good condition that will take you deep into the heart of the wildlands. Roads vary widely in difficulty. Flatter roads give riders a close-up view of resident wildlife, while steep and strenuous hills offer breathtaking views that extend from the cliffs and valleys of the former Fort Ord to the Salinas Valley and the Gabilan Mountains. This eight mile route is a great introduction to biking at the Fort Ord National Monument. It has several hills, including one that is a slow and steady climb over three-quarters of a mile. The views from the top are amazing, and the downhill that comes after will give you a chance to rest your legs! Park at the lot at Gigling Road and Eighth Avenue. East and south of this point, Fort Ord is closed to all motor traffic. Hop on your bike and take Gigling Road east for a mile and a half. You&apos;ll ride through forests of coast live oaks. Turn left onto Hennekens Ranch Road, and prepare for a long hill climb. The reward, however, is a spectacular view of the wildlands of Fort Ord, as well as Toro Peak and parts of the Salinas Valley. It&apos;s a perfect spot to pull off, catch your breath, and admire the landscape. Follow Hennekens Ranch Road until it ends (about 1.8 miles), and turn right onto Eucalyptus Road - and prepare for another steep hill! From the top, you&apos;ll look east over Fort Ord, and may be able to catch a glimpse of the ocean in the distance. Follow for 2.7 miles from Hennekens Ranch until the second time you see Parker Flats Road, and turn right. Follow Parker Road for just over 2/3 of a mile, and turn right on Normandy. Follow Normandy for just over 2/3 of a mile, and turn left onto the 8th Avenue Extension. This will bring you back to the parking lot. April&apos;s Sea Otter Classic holds many rides and races on Fort Ord. This 4 day event is one of the largest consumer bike expos in the world and brings over 10,000 bikers and 50,000 fans from across the globe. The Fort Ord National Monument has a vast array of endangered and rare species of plants and animals, some of which are rarely found outside Fort Ord. Animals that can often be seen in this coastal region include black tailed deer, turkeys, bobcats, coyotes, badgers, red tailed hawks, Canadian geese, California quail, gopher snakes, coast horned lizards, golden eagles, and mountain lions. The botany on this terrain is just as diverse as the animals that roam it. Fort Ord has vegetation ranging from maritime chaparral to grasslands, marshes and gorgeous fields of wildflowers. 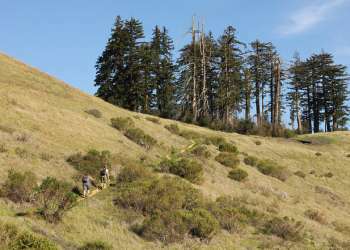 Click here for a BLM-maintained list of rare plants found at Fort Ord. The Fort Ord National Monument has two main access points. The Creekside Terrace Trailhead is located off of Reservation Road and the Badger Hills Trailhead is located off of Highway 68 in Salinas (across from the Toro Cafe).